C. CHAINSAW SCULPTURES FOR SCHOOLS/PUBLIC PLACES: Dickin Medal Memorial, Woodbank Memorial Park, Stockport. Dickin Medal Memorial, Woodbank Memorial Park, Stockport. 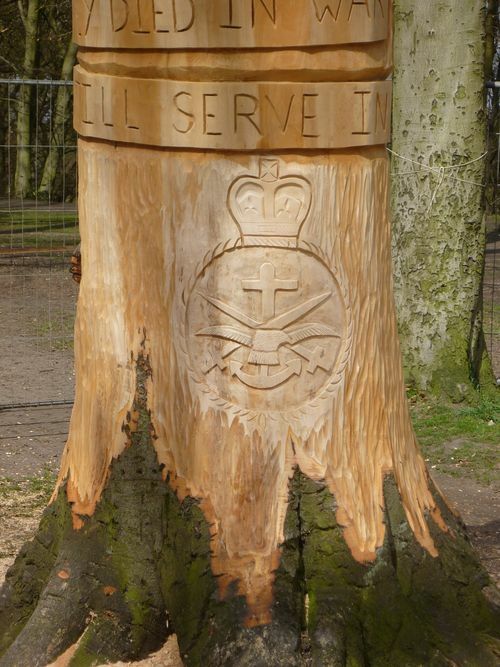 This chainsaw sculpted Memorial to recipients of the Dickin Medal (the animal equivalent of the Victoria Cross), is in Woodbank Memorial Park, Stockport. There is a horse at the top, a mule, a carrier pigeon, a cat, an Alsation, and a mongrel dog that found people trapped by the Blitz bombings - as well as a dove of peace, and an inscription - 'They died in war - they still serve in conflict', and the Ministry of Defence emblem - shown in this photo. The sculpture is over 16 feet tall.